It’s soothing, it’s simple and boy do we welcome it after a week of holiday binging! The Italian name for one of the favorite sipping soups of all time is “Brodo” or Broth. You probably have most everything you need in your refrigerator to make a big pot of panacea including leftover turkey and maybe some celery, carrots and onion from your stuffing recipe. If you can add a couple of rutabagas, some leeks, a few bay leaves and a squeeze of lemon, you won’t believe how delicious this pot of soup will be! If you ask my family, they’ll tell you that I make a pretty decent Brodo–especially with leftover turkey parts or better yet, the carcass of a Thanksgiving turkey. I’ve tweaked my recipe through the years, and, at least for now, this is my favorite variation. So after this last week of feasting, make a big pot of Brodo. It’ll sooth your tummy and feed your soul. Place above ingredients in a large soup pot and bring to boil. Turn down heat and simmer the soup for about 1 1/2 hours. Once the broth is cooked, remove turkey parts to cool down. Strain vegetables and discard. Serve broth alone or make turkey meatballs. Preheat oven to 375 degrees. When turkey from the soup is cool enough to touch, carefully remove all bones and gristle. In a food processor, pulse the turkey so it is chopped fine but not pasty. In a medium pan, sauté onions and garlic in olive oil until translucent, about 5-6 minutes. Cool down. In a large bowl, mix together the chopped turkey, sautéed onions and garlic, eggs, breadcrumbs, cheese, parsley, soup broth, salt and pepper. Mix ingredients well with hands or large spoon. Roll turkey mixture into balls, either small or large. Roll the balls around in the breadcrumbs to coat. Gently grease a baking sheet. Place turkey balls on baking sheet and bake for about 25 minutes if large, about 15 minutes if turkey balls are small. 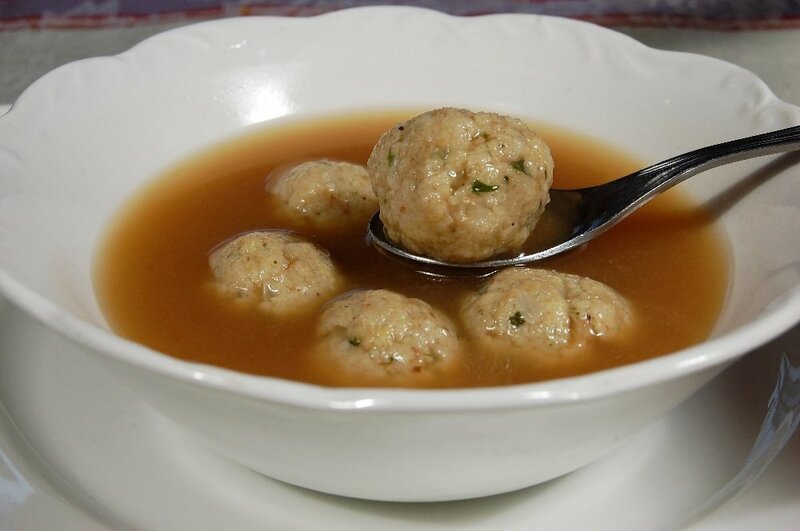 Drop turkey balls into broth. Add pasta like Orzo or Acini di Pepe, cooking according to package instructions.